Alcohol stoves seem to be the darling of anyone trying to “lighten up” in terms of their pack weight. Just one problem: There are so many alcohol stoves out there, how can anyone make sense of them all? Some stoves are fussy and hard to work with. Others are unstable, more likely to spill than to cook your dinner. Still others take forever and the slightest breath of wind robs them of all their heat. While I want to lighten up as much as the next guy, I want a stove that works. There are some good stoves out there, and I’ve “done the math” to pick one out, which is presented below. But before I go on, let me say that alcohol stoves aren’t for everybody. Most alcohol stoves do only one thing well: boil water. If you’re a gourmet cook, you may as well skip this article. 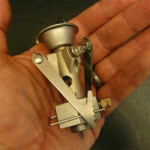 But if you’re seriously trying to lighten your pack, my pick for an alcohol stove is worth a read. With a lightweight stove setup like this one, I’m able to get a typical fair weather weekend load down to under twenty-five pounds including food and one liter of water. That’s without cutting any comforts. If I want to start really scrimping, I can go even lower. Some of my typical gear (L to R): Sleeping bag, 19oz; sleeping mat, 13 oz; Nalgene 1 liter bottle, 4oz; my entire kitchen (except food), 16oz; shelter (not including stakes), 11oz. I’ve already listed some of the problems commonly associated with (some) alcohol stoves. They can be fussy and hard to work with, unstable and excessively slow, particularly in wind. We need a stove that is simple, stable, reasonably fast (by alcohol standards) and works well in wind. And of course we want it to be efficient. 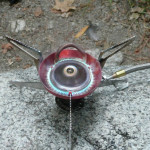 I have just such a stove in mind: The Caldera Cone ultralight alcohol stove system. Note: You can buy a kits with pot, fuel bottle, burner, and windscreen, etc, or you can buy just the burner and windscreen and customize your setup from there. My setup is a customization but is fairly representative of a typical setup. Now that may look like a lot, but don’t be intimidated. That’s my entire kitchen: stove, pot, bowl, utensil, lighter and fuel. 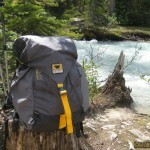 Best of all, it all nests together in a stuff sack like a nice, compact package. Just ignore the mud spatters from last night’s rain. So, what all is in this package? Let’s open it up and see. First, I’m using an MSR Titan kettle (generally sold separately from the stove). Nested in the Titan kettle is a plain old Ziploc container like you can get at any grocery store. I’ve wrapped the Ziploc container in a “cozy” (to retain heat) made out of Reflectix material. Nested inside are all of the components (burner, windscreen, fuel, spoon, lighter, and fuel measuring cup). I’ve already pulled the burner out in this photo. The burner is a “Pepsi can” style stove, called the “10-12 stove.” It is very well made (unlike most home made ones I’ve seen), and it’s optimized to work with the special windscreen. Now, we come to the real genius of this set up: the windscreen. The windscreen dovetails to itself such that it becomes a very solid, stable cylindrical windscreen and pot support. Your pot then slides into the “sleeve” formed by the windscreen. Note how the windscreen buts up right under the rim of the pot. Note that this tight fit is custom by pot. In other words, you have to buy the specific version of the Caldera Cone windscreen for your pot. A Caldera Cone windscreen for an MSR Titan kettle will only fit an MSR Titan kettle. This custom fit works great, but it does limit you to one pot. I don’t find this limitation overly restrictive. The burner is inside the windscreen, centered on the pot. By combining the pot support and the windscreen into one, a substantial amount of weight has been saved. Add to that the fact that the windscreen is of a highly effective design, and you’ve got yourself one lightweight, wind-effective stove. This stove is stable, efficient and performs well even in gusty, strong winds. I’m boiling water on the stove. The Ziploc container stands ready nearby. My food is already inside the container. When the water boils, I’ll pour the requisite amount into the Ziploc container, screw on the lid, and let everything steep. In a few minutes, I’ll be chowing down, having a cup of hot tea, or what have you. Enjoy! I do! Well, there you have it, my pick for an alcohol stove, a complete system, the Caldera Cone. As always, you should consider your particular circumstances and your particular style before you invest in this or any stove system. But for my money, the Caldera Cone ultralight stove system is a dang good one.